The first few days of a new limited format are some of the best a magic player gets to experience. There are countless resources out there to prepare you for the first time you sit down to crack some digital or paper packs for a sealed or draft event. But all the set reviews, articles, podcasts, and videos can’t prepare you for actually seeing the cards in action. 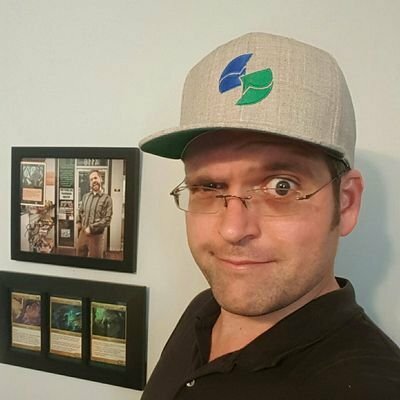 I had the benefit of participating in the MTG Arena Streamer Early Access event sponsored by WOTC and have subsequently played in over ten Sealed deck leagues. Based on this initial data, I’d like to explore the strengths and weaknesses of each guild by examining its guild-specific commons. Before we get in to that, I wanted to share some general thoughts I have about the format. 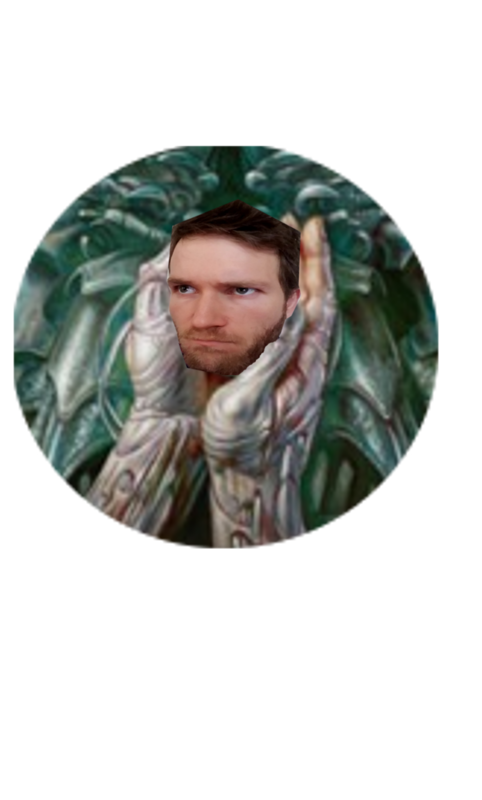 There isn’t an aggro boogeyman in RNA like there was in GRN. Rakdos and Gruul can apply pressure, but there’s nothing close to the kind of curves Boros pools had to offer. On the other hand, there also doesn’t seem to be the prevalence of absurd control decks. GRN sealed often gave people access to fantastic Grixis control decks backed up by Surveil and Jump-Start to help sculpt draws and mitigate mana flood and an abundance of removal and countermagic. This set seems to strike a nicer balance between the extremes of Boros and Grixis. Most of my decks have been three color: base two color splashing a third. Sometimes you get a strong single guild deck, but more often than not three colors will be the norm. Your bombs and your guildgates are going to determine what colors you play a lot of the time. There are not a lot of good two drops. The better ones like Sauroform Hybrid, Impassioned Orator, and Sage’s Row Savant are not to be overlooked. Lockets are great in Sealed. I’ve been very happy playing 1-2 Lockets in each of my decks. Games are going long. Getting to ramp early and then cast Divination later in the game is very much worth a card. All right, on to the guilds! Commons are the most important cards for any limited format. Sure, splashy rares and build-around uncommons will be the strongest cards in your deck, but the cards that you’re going to play with and against game in and game out are those lowly commons. In RNA, the mono colored commons are all fairly weak. Aside from a handful of stand outs the strongest commons you can get are guild specific, which makes sense. The format is centered around the five guilds, so once you find your correct lane you want to feel rewarded by getting passed strong cards that are difficult for anyone else to cast. Unfortunately for Simic, the power level isn’t there. I hope Aeromunculus has been going to the gym because it's going to need to carry this guild a long way to compete with the other four. This card checks all the boxes: it’s evasive, it’s reasonably costed, it’s good on turn three, and good later in the game with the Adapt ability. But the rest of Simic offers very little. Growth Spiral is a poor excuse for a ramp card, even on turn two, since you’d rather be playing a two drop to affect the board. Applied Biomancy is a flexible trick, and I always want the first copy of a blue bounce spell in my draft decks. 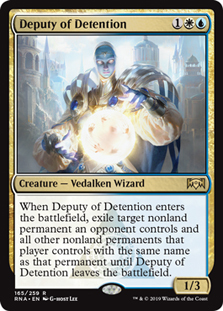 But it’s a bad look when the mono colored bounce spell Arrester’s Admonition is just better than this 10 out of 10 times. Lastly, we have Scuttlegator which allows you for the low price of 14 mana to build your own Ancient Brontodon. Need I say more? Even beyond the low power of these cards is one glaring problem. Did you catch it? There’s NO REMOVAL in Simic. Aside from bounce and counterspells, blue and green only have access to two “removal” spells at common. There’s the combat trick with upside in Slimebind and the fight spell (that doesn’t boost power and toughness) in Titanic Brawl. This is the only guild that doesn’t get a removal spell at common and it shows. I also think that Adapt is a dangerous mechanic. I can certainly imagine great scenarious where the ability sits there as a threat of activation enabling attacks you wouldn’t otherwise get. Or when you get to pass the turn with removal or a counterspell and have the flexibility to adapt instead. But there’s also the danger of adapting into open mana on your opponent’s side of the battlefield. Spending four mana to add some number of +1/+1 counters onto your creature only to have it be removed from under you is a huge tempo loss. This guild requires some real help from its rares and uncommons to make it a contender in this format, and even then, you may come up short on ways to interact with your opponent’s board. Where’s the beef? It’s in Gruul of course! One need look no further than Frenzied Arynx to think that this color pair is stacked. That’s a lot of text piled on to a common! 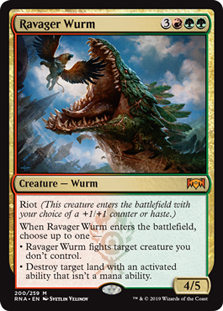 More often than not this is coming down as a 4/4, which is usually going to be the biggest creature on the battlefield by a significant margin. Beyond this overstatted creature, Gruul gets access to a good removal spell in Savage Smash. Folks familiar with Khans of Tarkir limited will be reminded of Savage Punch. Both cards play out very similarly, with Savage Smash often removing a blocker and enabling an attack in the same turn. Which is very much on point with what the Gruul creatures are hoping to do. Riot. Smash. Repeat. The other two guild commons leave something to be desired. Rubblebelt Runner as a Centaur Courser with “can’t be blocked by Afterlife tokens” text is fine, but you’d almost certainly rather have Burning-Tree Vandal as your three drop. And Rubble Slinger feels oddly out of place. 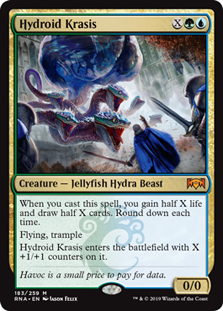 I love creatures with Reach and I’m very happy to have one with hybrid mana in its cost so more decks have access to it. But blocking flyers is not what this deck is trying to do at all. If the Gruul deck is worried about racing some low power flyers, it’d be better of running Brush Strider to gain a little life and then send it on into the red zone. I think we can all agree Addendum is a bit of a bust for Limited. I’m not sure how viable Dovin’s Acuity is for draft, but that’s our only pay-off for building around this mechanic. This color pair more so relies on its cards' raw power level. And I think it was handed that in spades. Lawmage’s Binding is one of the best removal spells in the set. It’s cheap, instant speed and even shuts off activated abilities. There’s also not a lot of Naturalize effects in the format, so this is even stronger than usual. Next up is Azorius Knight-Arbiter. With the recent Rivals of Ixalan drafts on MTG Arena, it's hard to not make comparisons to Sun Crested Pterodon when this card was spoiled. Well, if that card was the Chicken, then Knight-Arbiter is Colonel Sanders. This card blocks just about everything on the ground all while dealing two damage a turn to your opponent. Senate Griffin is another rock solid card as an evasive threat that helps sculpt your hand. All three of these are some of the best commons in the entire set, and they’re all concentrated in one guild. Sphinx’s Insight is the weak link. Ari Lax recently tweeted that he thought this was just a worse option than Azorius Locket and I’m inclined to agree with him. Not only do I think Lockets are just better on average (even in draft probably) than they were in GRN, but once we move in to the 4 CMC slot, there’s a lot of competition, and I don’t think this can match up against some of the other options you might have for your deck. But 3 out of 4 commons ain’t bad! Azorius also benefits from white and blue having some of the stronger mono colored commons in the format. Chillbringer is just an absurdly powerful magic card, being able to close out the games in which you’re ahead and help buy you time in those that you’re behind. Impassioned Orator is one of the best two drops giving you a lot of incidental lifegain (especially in multiples, and definitely with Afterlife.) And Arrester’s Admonition and Summary Judgment are some of the better and cheaper ways to interact at instant speed. While you can certainly get a lot of power as you move up the rarity ranks, Azorius has plenty at common that I’d be happy to maindeck. All right, so here is where my theory really goes out the window. I can’t quite put my finger on it, but for some reason Rakdos decks have felt very strong and consistent on both sides of the battlefield. And it’s not because of the guild commons. Get the Point is a great removal spell. Instant speed kill anything with a nice bonus of scry 1 attached to it is just what the doctor ordered. But the rest are all filler at best. 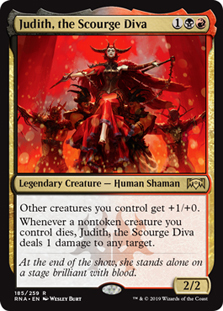 Rakdos Roustabout ensures you will enable Spectacle if it has the chance to attack, but a 3/2 for three is very replaceable in this format and the Roustabout doesn’t do much more than have power and toughness. Rafter Demon was the early Rakdos common spoiled, and neither side is desirable. There are better things to do at both of the CMCs this card offers and it’s almost certainly trading down on mana in combat. Footlight Fiend is the last of the bunch, and while I am aware this card combines with Bladebrand to potentially get a two-for-one, I do not like putting bad cards in my deck to make my good cards better and consider the Fiend to be strictly a sideboard card. So why does Rakdos play out so well? For one thing, it has access to a density of strong removal. Grotesque Demise, Skewer the Critics, and Scorchmark all at common make for a removal suite unparalleled by any guild. It also has a mechanic that snowballs very effectively. While a lot of the enablers and payoffs exist at higher rarities, three cards beg to be mentioned: Blade Juggler, Spear Spewer, and Dead Revels. The first as a one-up of Phyrexian Rager when you can enable Spectacle, the second as a free enabler of the guilds mechanic, and the third as a sort of black divination in a deck that is happy to aggressively trade off one-for-one. I think that the Rakdos deck has the tools at common (and certainly at higher rarities) to provide synergy, removal, and card advantage to any limited deck, and those are three ingredients in any recipe for success. There are a lot of things to love about Orzhov in this set. Its guild mechanic, Afterlife, turns a handful of creatures into Doomed Travelers, and it turns out that creatures being inherent two-for-ones in limited is quite strong. But the biggest reason this guild has my heart is for its premium common removal spell: Final Payment. “Destroy Target Creature” on a two-mana instant is just not something we see and this card really delivers. Incidental lifegain, Afterlife creatures and creature tokens, and being able to respond to removal all make the additional cost on this card negligible in most parts of the game. I was originally wary of having too many of these in my deck, but I have quickly changed my tune and would happily run as many as I could get my hands on. And the rest of the guild commons for Orzhov are really solid as well. Grasping Thrull does suffer a bit from there being many good five mana creatures in the format, but I’ll take a flying Siege Rhino for one additional mana. Imperious Oligarch is a solid roleplayer and another good two drop in a format where there aren’t that many. And lastly Vizkopa Vampire gives you a bit more of that incidental lifegain, often able to trade off with another creature and gaining you a few points of life along the way. 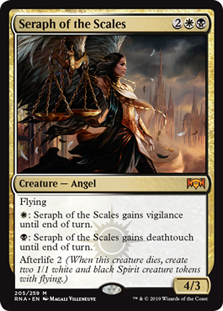 Moving up the rarity ranks we see even more ways to take advantage of the foundation these commons set up with sacrifice outlets and ways to boost the power and toughness of the flying Afterlife tokens. Strong removal, consistent synergy, and inherent two-for-ones. That’s what Orzhov does! What have your experiences been? Any cards or guilds you think I’ve missed out on? Let me know on twitter @lordtupperware. Now go forth and draft! If you want to wet your appetite, check out this pack one pick one from Cardsphere’s Draft Simulator.